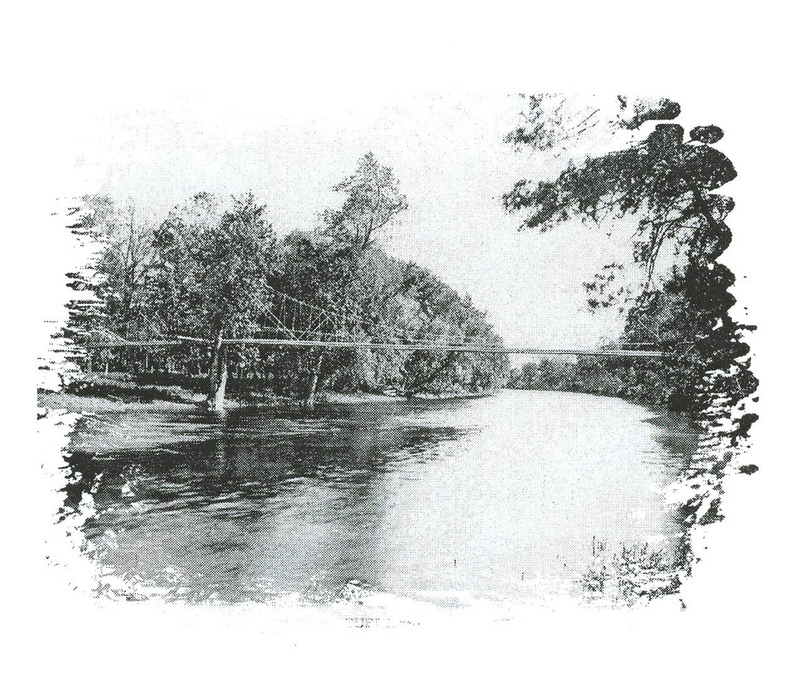 For 10,000 years, people have crossed the Des Plaines River in what is now the heart of Forest Home Cemetery. The cemetery's brand new Steadfast Bridge insures people will be able to cross the river for at at least another 100 years. A dedication of the new bridge was held Sunday, an opportunity for those to see the new span for the first time. 'Assistant Manager of Forest Home Cemetery Lisa Cajigas said, during the dedication, the cemetery has worked very hard to restore the dignity of Forest Home Cemetery. 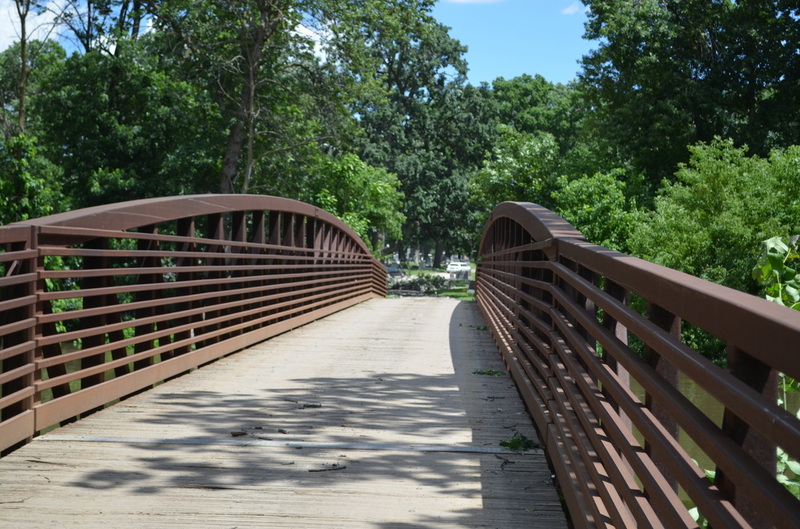 The Steadfast Bridge not only re-stores dignity, it restores the link between the Forest Park and Maywood sides of the historic cemetery Cajigas pointed out the merits of the new bridge (it has a 20 ton capacity), while not forgetting the faithful service of the old bridge. 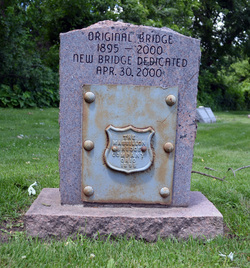 Attached to its granite face is the former bridge's iron name plate, which reads "The Massillon Bridge Co., Ohio,1895." 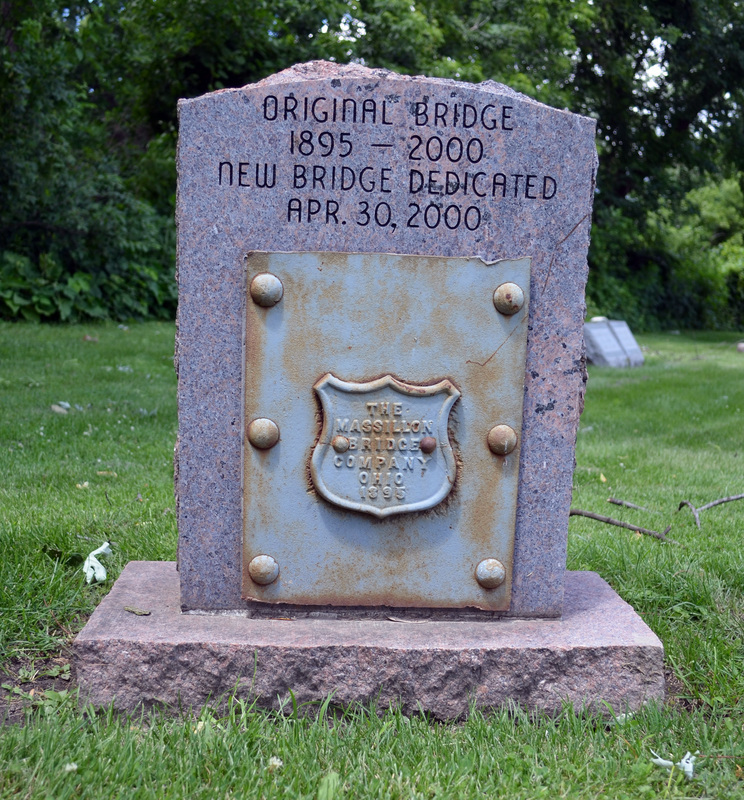 Carved into the granite are the words,"Original Bridge 1895-2000. New Bridge Dedicated April 30, 2000". Every 100 years or-so, Forest Home needs to replace its bridge. But, according to Eugene Propp, Forest Home's attorney, building a bridge to the new century is not as easy as it sounds. "If you're thinking of building a bridge," he said. "Don't do it. There isn't a governmental agency that didn't become involved. "The bridge had to pass muster with village,county, state and federal authorities, including the Army Corps of Engineers, before it could be built. "it was a long road", Propp said. "But no governmental money was involved. 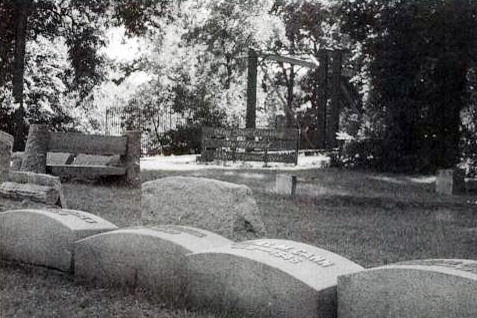 The bridge was entirely financed by the cemetery." According to Cajigas, building the structure itself cost $450,000. It took a month for Alabama-based Steadfast Bridges to complete the job. The company first tested the concrete supports of the old bridge and found them to be solid. They modified these supports with some fresh concrete and laid the bridge across the Des Plaines in four sections. 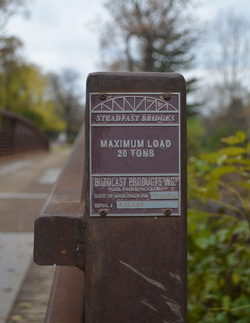 The graceful spans, forged by Blast Products, Inc., were made of Cor-Tcc steel. The bridge deck was planked with treated wood. After Propp finished his brief remarks, Dr.Orland, President of the Forest Park Historical Society, addressed the crowd of nearly 50 people at the dedication. He pointed out a "trail marker tree" on the bank of the Des Plaines near the new bridge. He said that American Indians would tie a sapling down into a loop to mark a trail, or river crossing. The tree would grow into an arch to guide travelers. The Indians apparently chose this spot, Orland said, "Because it's the best place to cross the river. "It didn't seem like the "best place" when the rickety-looking Massillon Bridge spanned the water. Orland recalled telling cemetery walkers to "break step" when crossing the old bridge years ago, so as not to jostle the old boards. "We won't have to break step on the new bridge," Orland said Mayor Anthony Calderone then look the podium, welcoming Village Commissioners Mark Hosty and Laureen Thornton, as well as Forest Home's receiver, Judge Saul Epton.The mayor recalled growing up in Forest Park and exploring the "new frontier" of Forest Home Cemetery on his bike.